The picture framing tips we offer in this blog section represent free advice. Our picture framing tips are designed to help you enjoy your framed art. These picture framing tips are also designed to help you discover ways to protect and safeguard your art. This section of our website is devoted to offering suggestions and picture framing tips that will benefit you with long-lasting quality framed art that is protected against premature fading or damage. The picture framing tips in this section are a working collection of tips and suggestions. This means that new tips are added frequently. We suggest you return here often to see the latest tips. The newest tips will be posted at the top of the page. Picture framing tips—put more than luck behind your search for a good picture framer. Sometimes people feel very “lucky” to have found a good picture framer. They might be right—if they did not research a picture’s framers resume of completed projects or investigate their level or quality. Don’t be confused by “luck” and a framer’s reputation for quality. Finding a quality picture framer requires more than luck. It takes a little investigation. Start by researching the historical account of their completed projects. The idea is to see if their designs have “evolved” positively or become blasé. Start the process by checking out a prospective picture framer’s reviews on Google, Yelp, Facebook, and other review websites. Reviews are only part of the evaluation process. We suggest you take your quality check, or investigation, one step further. You can do this by looking at their completed examples. Also, you need to discover if they promote themselves as a “conservation” quality, an “archival” quality, or a “museum” quality picture framer. Then, you need to find out if they are adhering to the highest standards that protect and safeguard the items you want to have framed. There are basically two ways to do this. It can be done either online or by visiting their picture frame shop. If you visit their shop, ask to see what they are currently working on. For online research, read their “about us” sections. Check to see if they have a “quality section” on their website. Your goal is to find a policy statement about their use of acid-free and lignin-free products–particularly mats and foamboard. Also, see if there is a mention regarding the use of UV protective glass on their website. 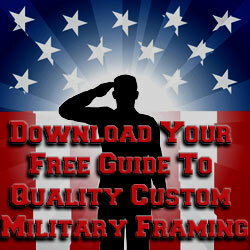 We state our policy regarding the use of UV protective glass in our Guide To Selecting A Military Framer. Quality picture framers will also make a similar statement. You can also read more on the use of UV protective glass below in our tips on UV protective glass. Most picture framers have social media accounts. So when in doubt about a framer’s quality, ask the prospective framer for a list of his/her social media accounts to see where they publish examples of their completed projects. Read the social media reviews and comments about their work. If you discover that they have classified themselves as a “conservation framer”, an “archival framer”, or a “museum grade” framer, you will need to ask a few more questions. Ask if they use 97% or higher UV protective glass. (Click here to learn more on glass protection.) Then ask them to show you where it is stated in their about us section, in their products section, or elsewhere on their website. Ask to see the certification sticker they put on the dust cover. Hopefully, they only use UV protective glass. Their sticker should tell you the degree of UV protection the glass provides. Avoid a picture framer who does not use UV protective glass. This tip will ensure your success in finding a framer who will not use “discount” products. Cheap or discount products will result in the early deterioration of your art. What Kind Of Glass Did My Framer Use? This picture framing tip requires you to be proactive. If you have had art framed in the past, and there is no reference about the type glass used, take the framed art to a reputable framer. A reputable framer can look at the glass and tell you if it contains UV protective coatings. If the items framed have either monetary value or sentimental value, consider having the glass replaced by the framer. We routinely replace non-UV protected glass for our customers. To recap the importance of not trusting luck to find a quality framer: do some basic research. Think about it, you would not buy art without looking at it first. So, why frame the art without looking at how the framer can complement it or enhance its appeal with a great frame design? The only way to achieve this is to look at examples of their work. Remember, counting on luck could result in a disappointment. The odds are—luck will run out! Put the odds in your favor by researching potential framers. Don’t gamble on the success of a custom framer. Instead, consider a framer that practices conservation framing. We discuss the need for conservation framing in our section on selecting a quality framer. Some picture framing tips need to be considered after you have purchased and framed art. One of them involves the location where you hang the framed art. This is one of the picture framing tips that many people never consider. This tip involves a way to prevent mold growth in a frame. This is an important concern for residents in high humidity areas. It is important that you do not hang framed art where air from an air conditioning vent will blow directly on the art. Our picture framing tip: do not hang framed art where air from the AC unit blows directly on the picture frame’s glass. The changes in temperature on the glass may result in moisture build-up (condensation) inside the frame. Although we have not reached air conditioning season just yet; it will be warm on the Georgia coast very soon. So begin to think about moving art away from AC vents. High humidity in our area can be a problem for framed art. This is especially the case when art has cold air blowing on it in the summer—particularly for us on the coast. Unfortunately, when moisture builds up, so does the tendency for mold to occur. Once mold begins to grow on the art, the services of an art conservator are required to eradicate the mold and repair the damage. And that will not be a cheap fix! You will be much better off in the long run if you do not hang framed art where air from an air conditioning vent will blow directly on the art. One of our most common picture framing tips is centered on the creation of a shadow box. Shadow box framing is not always cheap. The framer must work harder on a shadow box than a simple piece of art framed with a couple of mats. The framer’s objective when constructing a shadow box is to have the shadow box tell a story. Years of experience have taught us that people collect things dear to them for a reason. The items they collect reinforce memories of something that occurred in their lives. Most often they are attempting to reinforce positive memories or celebrate achievements. By creating a shadow box, their intention is to have us help them tell a visual story with the items or mementos they have collected. Unfortunately, a customer’s desire to create a shadow box does not always take into account the aesthetic design qualities that convey the story they wish to tell. Most often, customers do not bring in enough items to artistically convey their complete story. Simply put: Including an adequate number of objects in a shadow box is essential for telling the story. Our picture framing tip is this: We suggest that customers bring more objects to the framer than they think are needed to build a shadow box. Also, be prepared to tell your framer the story you want to portray in the shadow box. Spending time with the framer to verbally tell him/her what you are trying to achieve will enable them to artistically create a shadow box design that conveys your story. It is much better to have too many items during the initial consultation than to have too few items. This is where you must rely on the picture framer’s professional judgment and their artistic talent designing picture frames. The framer may not need all the objects. So, tell them about the most important ones you want to frame and how the items relate to the story you wish to tell. Often not having enough objects in the shadow box will result in a non-artistic or incomplete presentation of your story. We are custom picture framers with years of experience building shadow boxes based on military and civilian themes. We know how to tell a shadow box story. You can see some of the stories we have told in our shadow box section, framed guidons section, framed diplomas section, framed flag display cases, and framed medals section. Come see us and we will be glad to tell your story. Picture framing tips – use caution when cleaning picture frame glass or acrylic. Commercial glass cleaners are good for most glass and mirror cleaning projects—but not for picture frame glass or acrylics. In fact in some cases, a microfiber cloth with a little bit of picture frame glass cleaner is all you need for certain types of glass. Before proceeding to clean, consult your picture framer. One of the best picture framing tips we can offer is: Ask your framer to furnish you with cleaning instructions for the glass or acrylic he/she installed in your frame. Improper cleaning will damage the glass or the acrylic covering framed art. In the likelihood the original picture framer has gone out of business, you will need to do some research. You need to determine what glass the framer used on your art. There is a simple way to do this. Most reputable framers place a sticker on the dust cover with cleaning instructions or the name of the glass they used. If you can determine the type glass used, contact a reputable framer. Ask the framer for assistance with cleaning instructions based on the glass used. If there is not a sticker on the back, we suggest that you take the framed art to a reputable full-service custom picture framer. An experienced picture framer can evaluate the glass and recommend cleaning instructions. If you have any questions about the glass that covers your framed art, contact us. 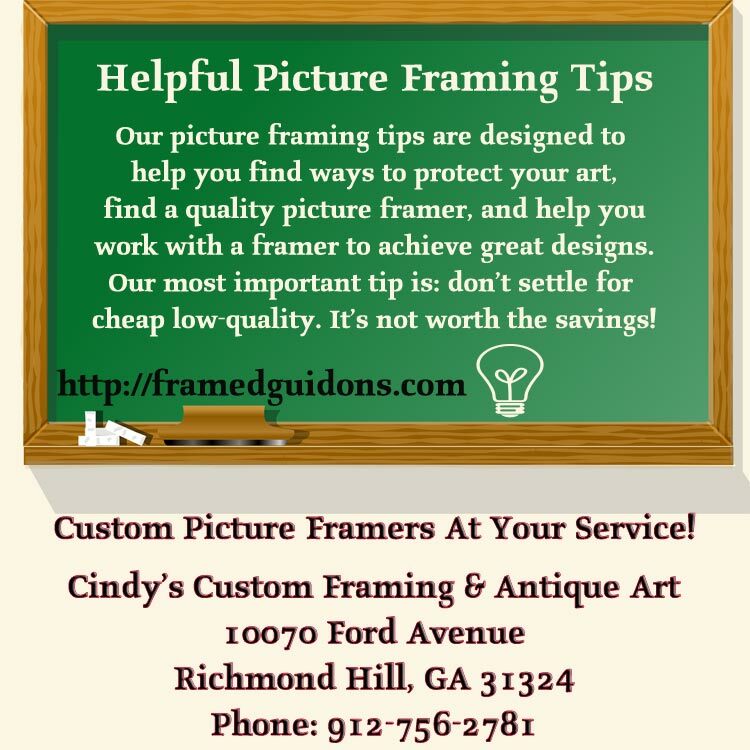 We are Cindy’s Custom Framing & Antique Art, Inc and we are located at 10070 Ford Avenue, Richmond Hill, GA 31324. Evaluating whether glass is UV protected or not is a courtesy we offer local customers. Our final glass cleaning picture framing tip: whatever you do, DO NOT use ammonia based glass cleaning chemicals on your framed art! One of our very important picture framing tips involves the use of UV protective glass for custom picture framing. As a matter of policy, we do not install or sell glass that does not offer 99% UV protection. 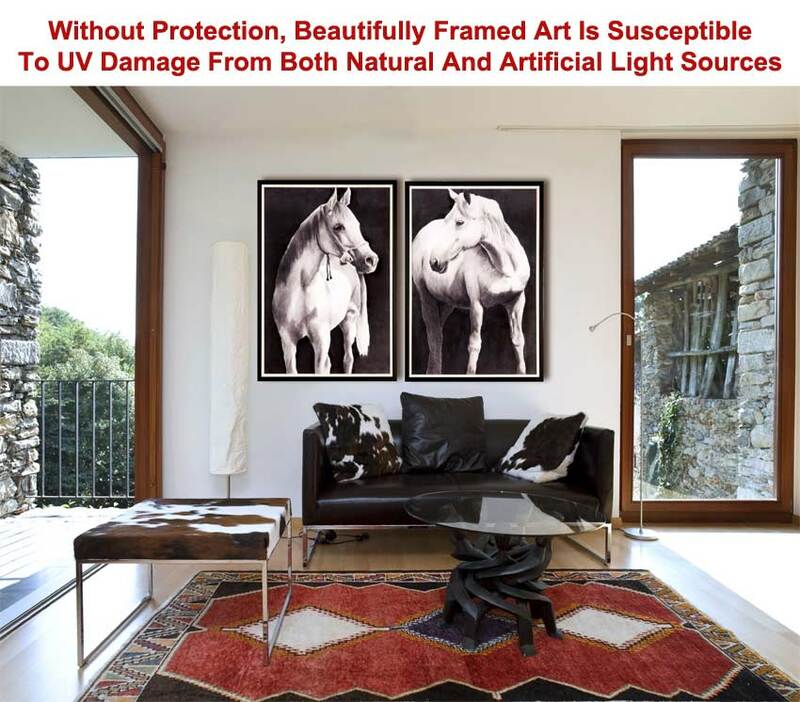 We believe that protecting your art against premature deterioration starts with UV protective glass or glazing. 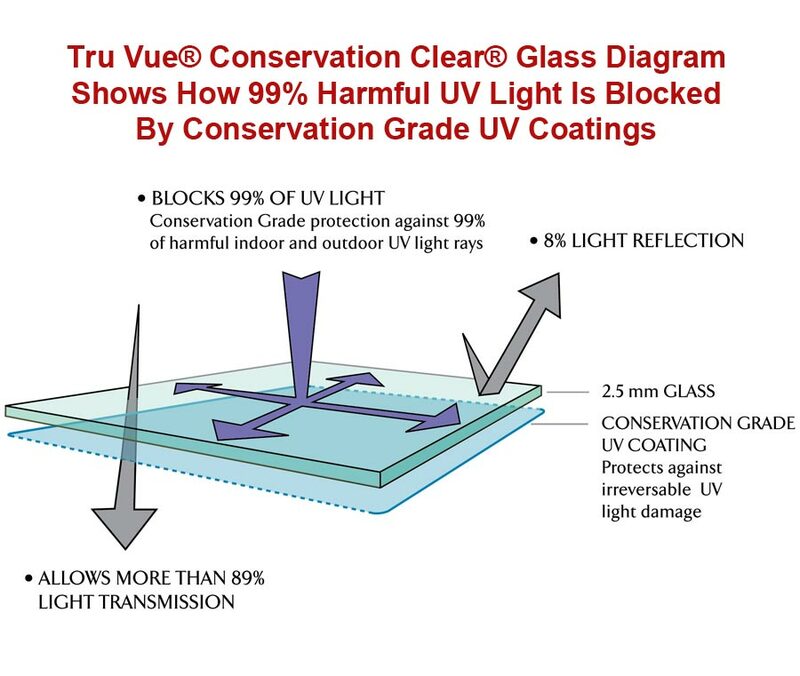 For example, this diagram shows how one of the glass types we sell protects your art against UV light. UV protective glass only costs a little more than non-UV protective glass. We consider framing with non-UV protective glass a cardinal sin that many picture framers resort to in order to save a few pennies on a frame job. The truth is, if they don’t give you the option to select UV protective glass, they are condemning your framed art to a very short life! Think about it: you have paid for the art and you are paying for a custom frame job. So, why would you throw all that away with art that is going to fade in a short time because it was not correctly protected as part of the framing process? Most limited edition prints vary in price from $150.00 up to $250.00 or more. The value of a limited edition print often goes up if it was produced by a popular artist. Some limited edition prints become so popular that their sales in the secondary market are much higher than the original price. Naturally, this is what we want to see. We want art to appreciate in value—not go down because of cheap picture framing practices. So, our UV protection tip is this: ALWAYS insist on UV protective glass that exceeds 97% UV protection. If you have any questions about UV protection or you doubt whether your picture framer used UV protective glass, feel free to contact us. We can evaluate your art to determine if it is protected. As we pointed out in our guide to selecting a framer, a bad picture framer is no joke. On that page, we define that bad picture framers are likely to damage your art. One of our objectives when meeting a new customer is to help them understand the difference between good and bad picture framing. 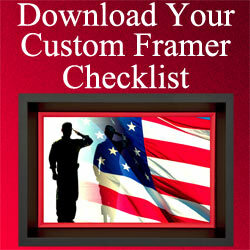 We have written a comprehensive page on selecting a military framer that discloses a number of key factors to consider when choosing a picture framer. For simplicity, we’re going to post some of the highlights periodically on this page that represents picture framing tips from that page. We will also provide additional tips not covered on that page. A very important tip we want to pass on involves selecting a framer based on their qualifications as a good designer. When looking for a custom picture framer, we suggest you search online for examples of their completed work. We also suggest that before you engage their services, you ask to see specific examples of what they have completed that is related to the type project you wish to have framed. For example, ask to see shadow boxes about golf if you’re engaging a custom picture framer in build a golf shadow box. Most importantly, don’t let the picture framer’s proposed design be about him or her. The design should be about protecting the items you want framed that achieves an artistic presentation. If the design centers on what the framer wants, ask them to explain their justification for mat colors, object placement, or frame selection. If there is no logic to their explanation, then you may wish to seek the services of another picture framer. Click here to read more about a picture framer’s deign qualifications in our guide to selecting a military framer. The picture framing tips in this section involve a picture framer’s policy towards reimbursing customers for lost or damaged art. As everyone knows, art has value. Sometimes the art’s value is based on the historic price paid for it. At other times, art appreciates in value. It appreciates because the artist who produced it has either died or has become very popular. But what is the value of a masterpiece created by a child or a parent when you intend to pass the art on to other generations? Basically, some items are priceless. And these are the items you would not part with for any reason. Therefore, trust and confidence become key decision elements when turning over your “treasures” to a picture framer for them to perform their work. However, what most people do now know is that many of the big box frame shops do not frame on their premises. Instead, the big box frame shops ship items out to a central facility that does their framing. Although you may have worked with a courteous, knowledgeable framer at a local big box store who created a design for you, that person is not the one who frames your art. In all likelihood, your art will probably be shipped across state lines for someone to handle that you do not know! We have heard horror stories from people seeking our intervention with national, big box stores who lost their art! Basically, since their “prime choice” for a picture framer was for a big box store that either lost or destroyed their art, we don’t have a dog in that fight! We can only offer a shoulder to cry on. Beyond that, the art is lost and nothing can be done! However, we wish to offer advice to anyone seeking the framing services of a big box store or a local frame shop. Big box stores, as well as, local frame shops have the potential to lose or damage a customer’s art. The trick is to know what their reimbursement rates are for losing or damaging your art. Our picture framing tip: Before framing, ask the framer to what degree your items are protected against loss or damage. Many framers limit their liability to only $200.00 if they lose or damage your work. Good framers carry special insurance for liability losses with much higher limits. So, before getting something framed, ask them for their liability limits. 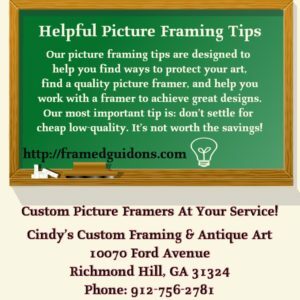 If their limit is low and you are seeking to have something expensive framed, then reconsider finding a new framer who offers adequate protection! Finally, this is another liability tip you should take seriously: when you select a framer, READ the work order before you sign it. Many framers gloss over their liability by having you sign a consent form that absolves them of financial damage due to loss or damage to the art! Sometimes the consent form requires you to acknowledge the miniscule amount you will be reimbursed as part of the work order contract. We consider that as a very sneaky practice that should be avoided. Please contact us if we can assist you with any of the tips discussed on this page. To learn more about us, please visit our About Us page.